Unlike stages with rack and pinion drive, the SD160 uses a spring loaded lead screw design against a solid stop, which ensures drift-free operation. The SD160 incorporates fast-pitch, screw drive positioning, and smooth ball bearing motion in the X, Y, Z, and Q axes for precision positioning. We use a simple color coded knob cap to identify axis location in low light conditions. For added positioning versatility, the top stage tilts at any angle through 360°, and includes 22-mm of linear travel along the probe axis. 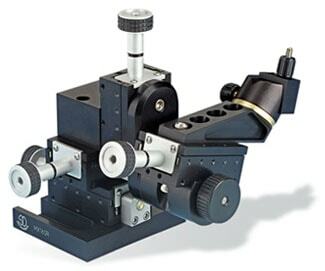 This feature plus 22-mm of X-axis travel make the MX160 ideal for axial cell probing. The SD160 has our MXC-45 mounted to the Q axis. The MXC-45’s built-in rotational stop allows easy electrode/pipette replacement. SD160s come standard with our ABP-R mounting plate. The design of this mounting plate enables coarse positioning between platform mounting holes as well as 360° of coarse rotational positioning. If rotation with a solid submicron level stop is required, the MX-RS rotation stage is designed to mount directly into the ABP-R as well as the SD160.